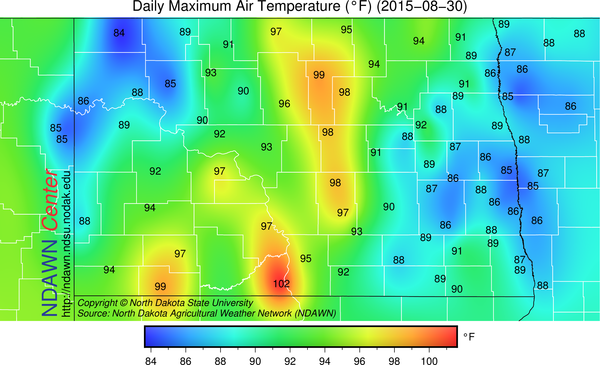 A cold front is currently located in eastern to central North Dakota from near Devils Lake to Fort Yates. This is part of a mid-latitude cyclone that is currently situation in central Manitoba. Along the front there has been some shower/thunderstorm activity, but locations that have recorded some precipitation has generally received very little rain. 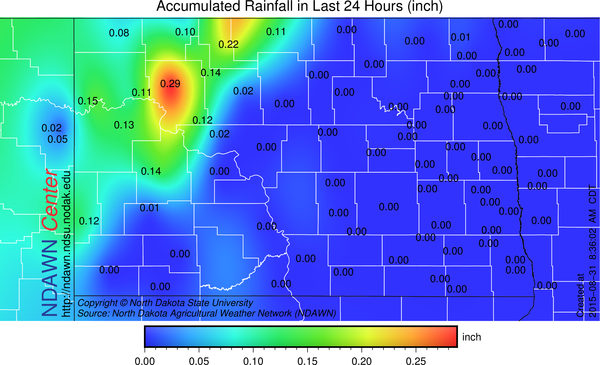 24 hour rainfall totals from the North Dakota Agricultural Weather Network mesonet stations were around 0.25 inches or less in the northwestern portion of North Dakota. Radar imagery is showing a line of showers with perhaps some rumbles of thunder in northeastern North Dakota closer to the area of low pressure in Canada and as the front progresses to the east at least some rainfall is expected, albeit overall light. northeastern North Dakota into northwestern Minnesota will likely be the best area for rain to occur and even there, it will be scattered. Southeastern North Dakota and west central Minnesota will also at least have a “chance” of recording some precipitation but the word “isolated” may fit those areas best. Locations in central North Dakota “flirted” with 100° on Sunday afternoon, with the NDAWN station in Fort Yates recording a maximum of 102°. The cold front as already pushed through those locations meaning maximums could be as much as 20° colder than what was recorded yesterday. 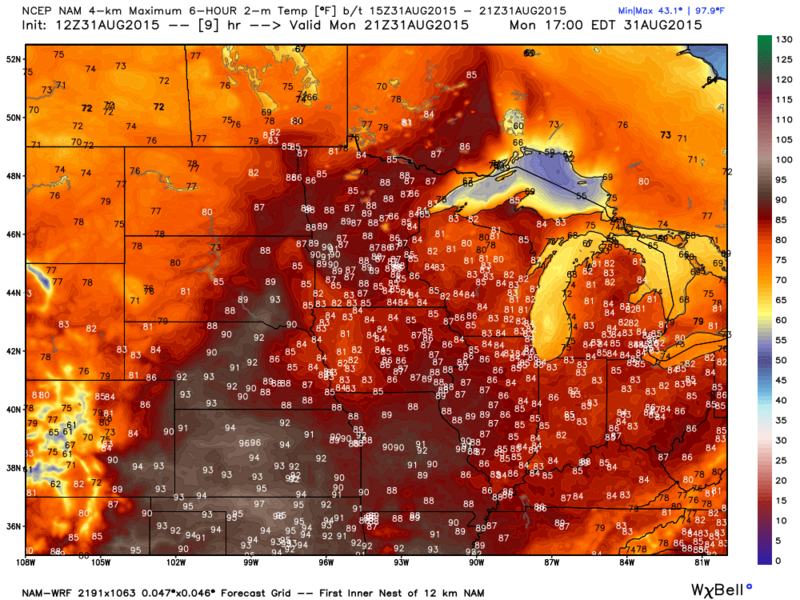 High temperatures in central and western North Dakota probably only reaching the 75° to 80° or the very low 80s range today, whereas, eastern North Dakota into western Minnesota will still potentially reach the mid to upper 80s depending on cloud cover and smoke thickness in the atmosphere. But this “cool” down will be temporary, as the warmer air from the weekend will return with maximums in the 80s tomorrow, then 90° + readings more likely on Wednesday and Thursday before slightly cooler air Friday and Saturday with a more substantial cooling on Sunday and Labor Day. Although there is a slight risk of a rain shower today, some spotty activity Wednesday Night, the main threat of rain this week will probably occur over the weekend in the form of thunderstorms. Therefore, warm and mostly dry in the short term, a bit cooler with a higher probability of rainfall toward the weekend.